When it came to cutting tax rates, the real question was not ‘if’ but ‘when’ to cut them, Economy and Development Minister Dimitri Papadimitriou said in an article on Sunday. In the article, the minister analysed the current scientific position and the research into the links between lower taxes and growth, noting that this “does not help political dialogue” for the simple reason that there was no “common position” unanimously adopted by the academic community. He also noted that existing research mainly refers to the period before 2010 and to advanced economies with stable tax systems and a greater tax “conscience”. Their findings were largely overturned after 2010, he noted, based on the International Monetary Fund (IMF) Working Paper “Growth Forecast Errors and Fiscal Multipliers”, which found that the multipliers are greater in times of recession and that the effectiveness of lowering tax rates is “doubtful”. “In times of extended recession and lack of financing in the economy, as is occurring in Greece, any benefit for businesses through taxation is channeled into increasing share capital or distributing an increased dividend and not to new investments,” he wrote. Papadimitriou also went on to cite other studies showing that the multiplier for public spending cuts is almost double that of tax revenue in Greece, meaning that if a cut in taxes boosts the economy by a given percentage, the public spending cuts that the lost revenue makes necessary will then reduce growth rates by double that percentage. “Consequently, the political position that ‘reducing taxation rates for businesses will result in growth’ is misleading and does not help in dealing with the problems that really prevent growth,” he said, outlining the factors that must be taken into account when making political decisions about the economy. Papadimitriou said the main goals of policy makers must address the known problems of the economy, with action to ensure macroeconomic stability, a sustainable fiscal situation, key infrastructure, well-functioning institutions, low tax evasion, low corruption, a stable tax system, a business-friendly environment, greater competitiveness, implementation of essential economic reforms and completion of beneficial privatisations that will increase the economy’s momentum. 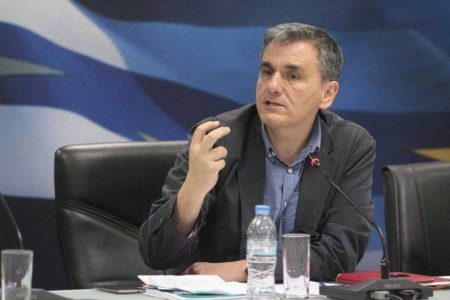 “Only in this way will the healthy productive forces of the country be activated, while also showing international markets that Greece has left the distortions created by the previous political establishment behind it,” the minister concluded.